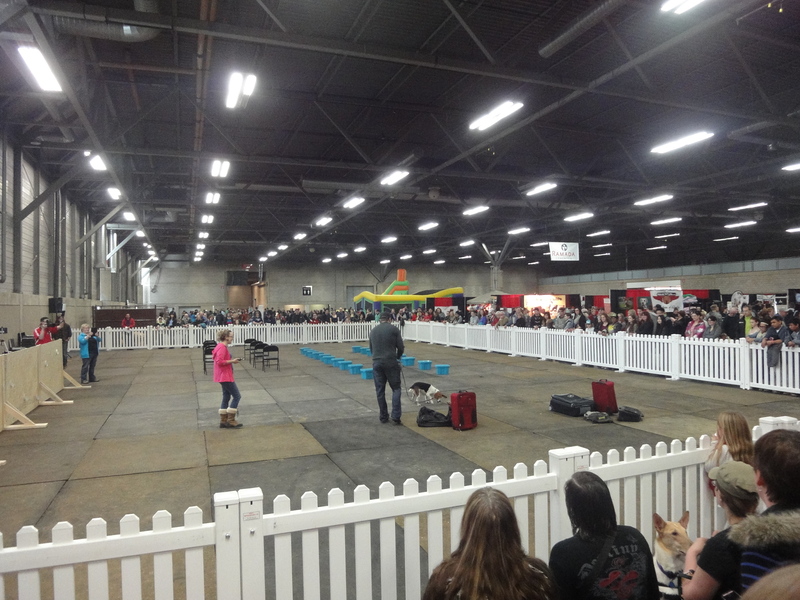 Today marks one full year since I made the trip from Halifax, Nova Scotia to Edmonton, Alberta. While I can’t deny that a part of me still hankers for the sight of the Atlantic and the sound of Maritime accents, this prairie city isn’t as bad as I expected. It helps that we live in one of the most liberal neighbourhoods of this ultra-conservative province. Both our MLA and our MP are women and members of the NDP Party, something that is unheard of in any other region. Just last night I saw an eight-year-old woman gardening in her underwear, right across the street from two young girls in princess dresses selling lemonade. 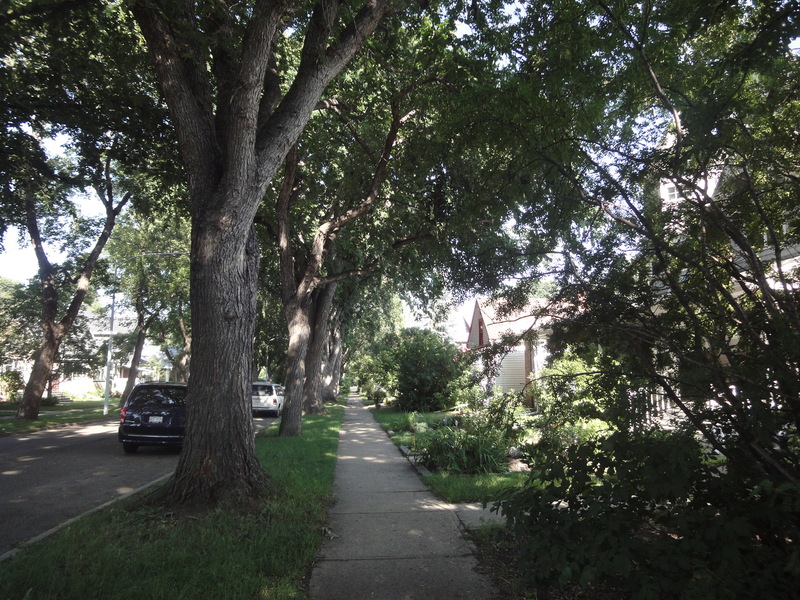 The streets are covered in thick, old trees that have likely been here at least as long as the homes. Mill Creek Ravine is a decent venue for dog walking, if filled with people who flout the rules. We are within walking distance of a fantastic farmer’s market and organic grocery store, and I can walk to and from work on a nice day. Life could be a lot worse. This doesn’t mean I am turning into an Albertan. There are a lot of things about the provincial culture which will never sit right with me. 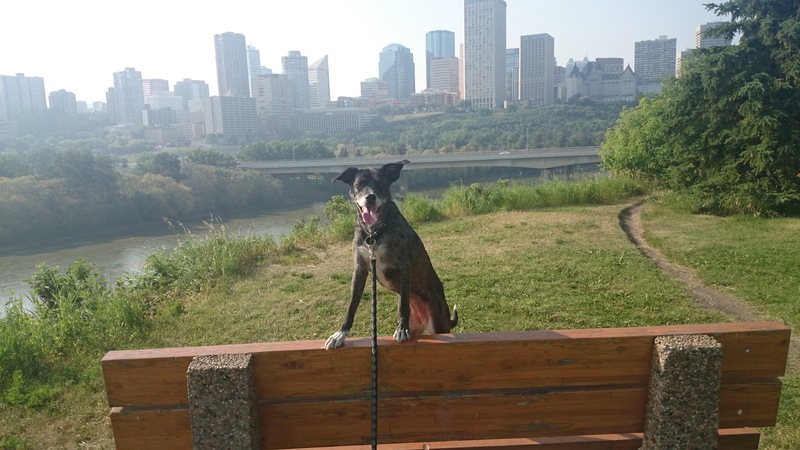 Edmonton may be more easygoing than Calgary, with a greater appreciation for art and alternative lifestyles, yet it still supports a lot of activities of which I will never be in favour. It is a bit hard to justify, I admit. We moved here because this is where the money is and we’ve made a lot of headway in paying off our debts. After 12 months all of our bills are paid and we feel like we have some breathing room for the first time in a while. For that reason, I owe this city a lot, even if I don’t like from where the wealth has come. The weather is nothing to recommend it either, I can’t deny. The winters are endless and the summers feel like a bluff of nature. In a way, that makes them more precious. The biggest problem is packing in everything we wish to do in such a short time. From the numerous food festivals and wooded campgrounds nearby, I am worried we aren’t going to savour enough of it before the snow returns. Before we moved here, I took things like green grass and soft leaves for granted. Never will I make that mistake again. Every warm day is to be embraced. Five year plan, is what we tell ourselves. Four more to go. As a stopping place on our journey to somewhere more in keeping with our goals and dreams? 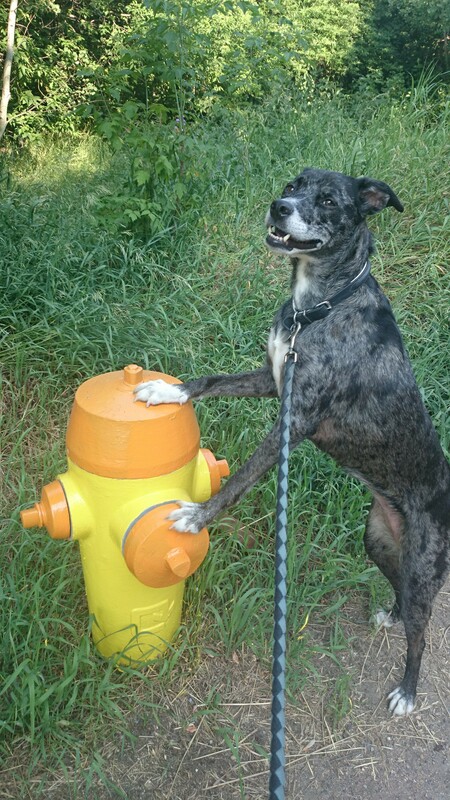 Edmonton, city of yellow and orange fire hydrants, will do. I have always revelled in a well-told story. Many of my especial childhood memories are of burrowing under a comforter while my father or mother, most often the former, read aloud. The best books were those featuring characters I understood. Sure and I enjoyed fairy tales and books with animals doing people-like things, but the best ones illustrated young girls and boys in my own time, exploring a world to which I could relate. Dragons, talking geese, and princesses in castles could only be so interesting. It was much easier to tuck into a realm that resembled my own. Settings were important. Good, well-rounded characters were vital. My reading choices haven’t changed very much. I still prefer reality to imaginary, biography to novel. The best writers, for me, are those who are capable of making me feel. It doesn’t matter if the location is fourteenth century Spain or modern day Toronto, if the characters don’t have honest flaws and tangible exertion, I am lost. I don’t have to relate. I do have to understand. In this way, science fiction and fantasy don’t make it to my night stand very often. Dystopia, travelogues, and history do. Reading can be an escape. It is also a chance to learn and to challenge myself. There is great value in struggle. It took me a year to finish Ulysses and I am afraid it will take me longer to finish The Sound and the Fury. But I will feel so much better for having made the accomplishment. Some people want to climb mountains or run marathons, I want to work my way to Proust. However, as much as I gain from toiling through books thicker than my thigh, when I read for pleasure, I mostly read memoir. I like to connect with other people who have experienced things I never will. Memoir is a glimpse into another life, another way of thinking. The stories are authentic, told by real people who felt compelled to share them. The first memoir I read was Amy Tan’s Opposite of Fate. I picked it up because I had enjoyed several of her novels and I’d always wanted to know how closely her terrifically flawed characters resembled her own life. I wasn’t disappointed. Not only did the book help me enjoy Ms. Tan’s fictional work even more, but it introduced me to a genre that has provided me with much larger benefits than simple entertainment. Memoir taught me that the best writers are those who make themselves vulnerable, who can show the reader, through the stories they reveal, what makes them cry. Yesterday I picked up a book of poetry for the first time in many years. The poetry section in my personal library maxes out at three. I allow the works of Homer in this count. I assumed I didn’t like it. I don’t enjoy long descriptions of flowers or mountains or Grecian urns. I don’t want to waste the little time I have interpreting Milton when I could be snuggling with Zamyatin. Despite this lifelong horror of verse, when I found a volume entitled Dog Songs, I couldn’t resist. I guess it makes sense that the first poem I read in over a year has to do with canines – what else? It helped that Mary Oliver’s collection isn’t very long. Accompanying the poems are sunny sketches of the dogs she recollects. I don’t know if the pictures made all the difference, made the words more visible, however, once I began reading I couldn’t stop. Within too short a period I was finished and longing for more. The poems didn’t feel like poems. They were written in poetic style and given the author’s impressive credentials, including a Pulitzer Prize, I am certain they are of brilliant poetic quality. To me, they read more like stories. Almost, like poetic memoir. It is possible I have been wrong about poetry all this time. Though there are many poems that are just one long ramble about the beauty of the stars, I have been shown, by a fellow dog lover, that poetry can also tell intense personal stories. Bursts of real life in verse form. By the end, I felt I understood the author. I know she had a hound named Benjamin who ate field mice and she later formed a treasured bond with Percy of the curly white fur. Her grief was ripe when she shared his passing. Through her words, I gained a sense of personal struggles and drastic change. Though Mary Oliver has lead a life far different from mine, I related to her joy in dogs off-leash and her worries when her friends drifted far. I learned what made her cry. I don’t see myself ever writing poetry, you can sigh in relief. I would have to spend years reading it to ever get up the nerve to try and, as we have learned, I still haven’t finished Faulkner. Mary Oliver’s Dog Songs has inspired me in other ways, reminded me there is more than one way to be vulnerable. I hope after all these years I have given you an idea of who I am, other than just Shiva’s exhausted owner. Not that this is a terrible way to define myself. I do hope you have been able to relate in some way, that I have made myself open and that I have helped you do the same. Because I am not sure how to close, I am going to end with a quote from Oliver’s “Percy Wakes Me” because I think it is apt. It is my goal to one day describe this blog in a similar way. 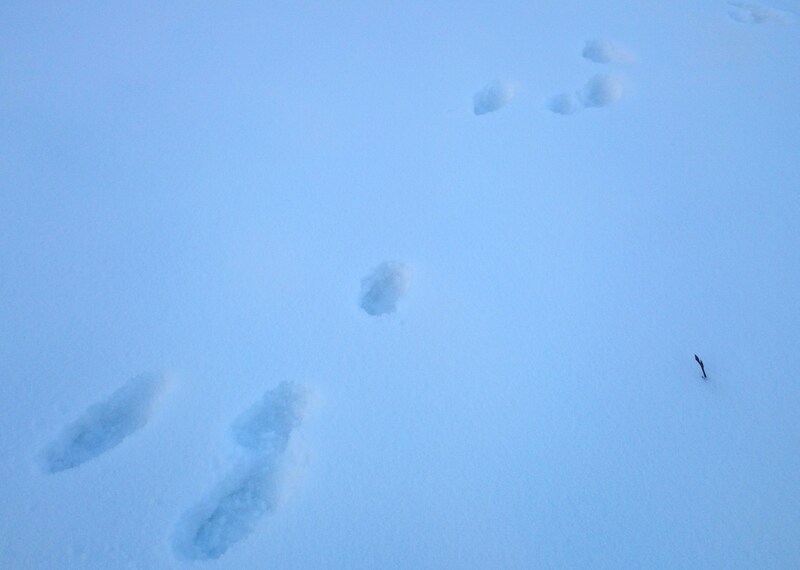 One of my favourite things about early morning walks in the snow are the signs of wild animals I spot everywhere. Before the bootprints of other humans, or the tell-tale marks of pet dogs, have trod all over the white canvas, it is easy to pick up the more unusual traces of more exotic species. It also shows me a little bit of the reason behind Shiva’s sniffing madness. No wonder she can’t resist the seduction of the hideaway under the branches, when so many animals call it home. Most of the tracks are easy to decipher. 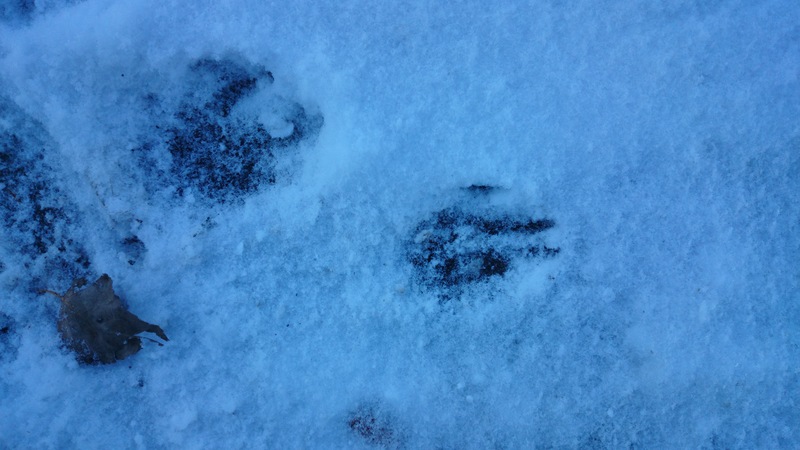 Squirrels, mice, and birds make up the majority of pawprints in the snow. The rabbits are even simpler to detect, with their larger hind legs and their funny hop. That doesn’t make these smaller animals less fun to track. 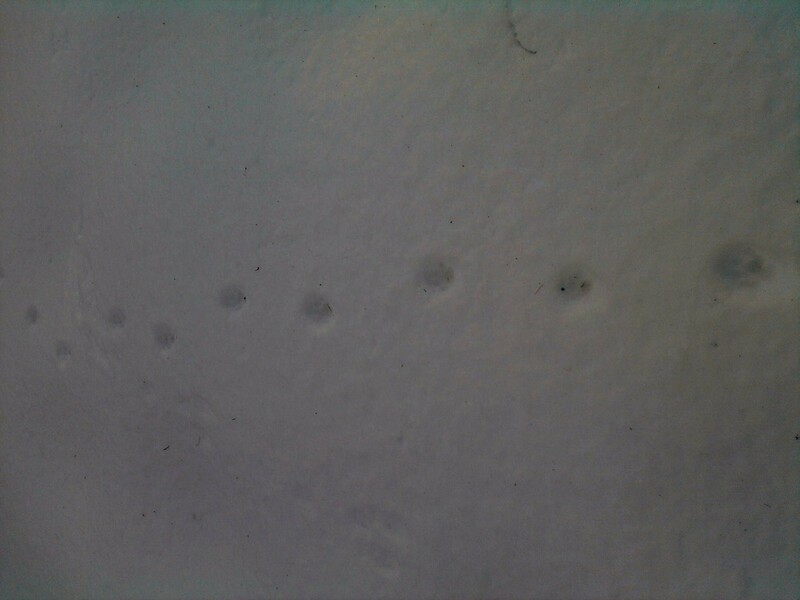 I take great joy in following a bunny trail, hoping if we can just go far enough, we will find a utopian burrow. Our own Watership Down. There is a certain part of the forest in the river valley that I love to visit the most after a recent snow fall. 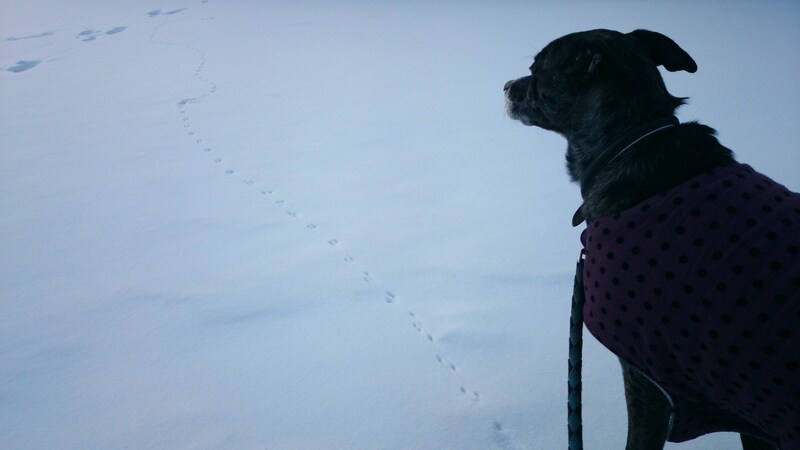 It could be wishful thinking, but every time Shiva and I visit there – as long as we make it before everyone else – I see small, canine-like prints scattered along the side of the path and leading up a hill. 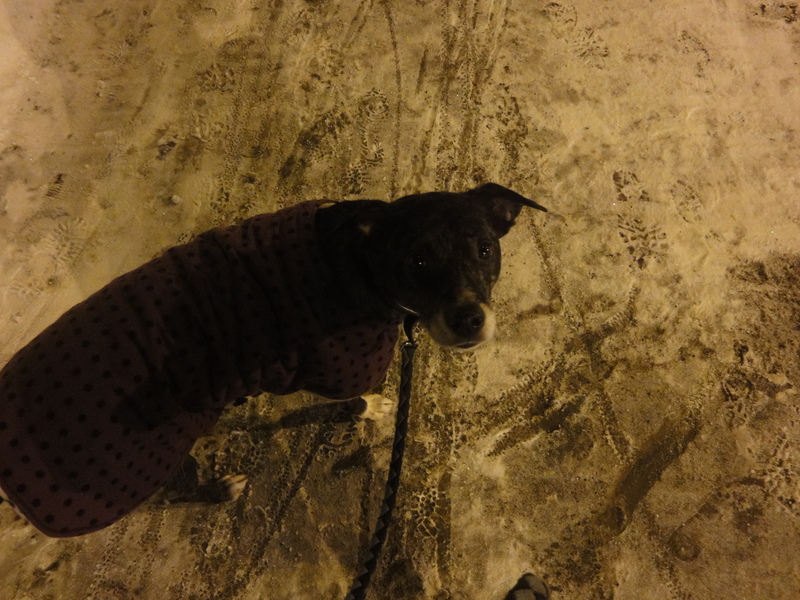 There are no human tracks around these footfalls, so I know they can’t be made by an off-leash dog. I like to believe there is a fox den nearby and dream of catching sight of one eventually, if we are quiet enough. Alas, I am sure whatever animal is creating these tracks would run off long before we entered the area. For all I know the prints are those of someone’s cat or a small dog that has strayed too far. But I like to believe in the secrets of a fox den. It makes me smile to think such special creatures could be living near my front yard. Every once in a while I will come across prints that I can’t interpret. In all my years of dog walking, I have seen raccoon and porcupine and coyote, I know all of the above roam freely in the ravine of our city. But these tracks that Shiva found recently don’t match those of which I have become familiar. I can’t determine what they are or even make a solid guess. This is a northern city with northern animals, I assumed I had seen them all. But I still have yet to even come up with the possible perpetrator of the below prints. I wish my photographs were better. They had to be snapped quickly as there were joggers on the path behind us and Shiva was giving them the evil eye. But the toes looked long and there weren’t the normal pad marks from dog paws. 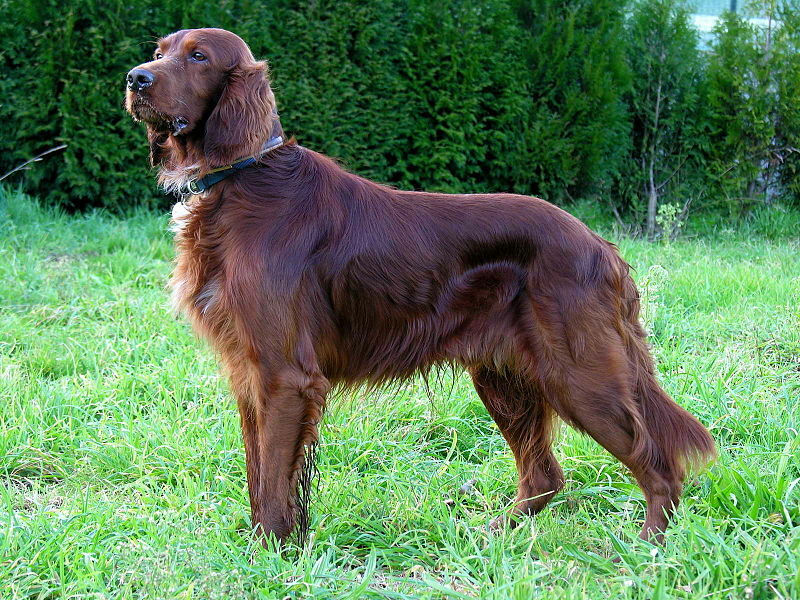 Perhaps I am wrong and they are canine, maybe a dog with more fur which would not necessarily show in the snow. 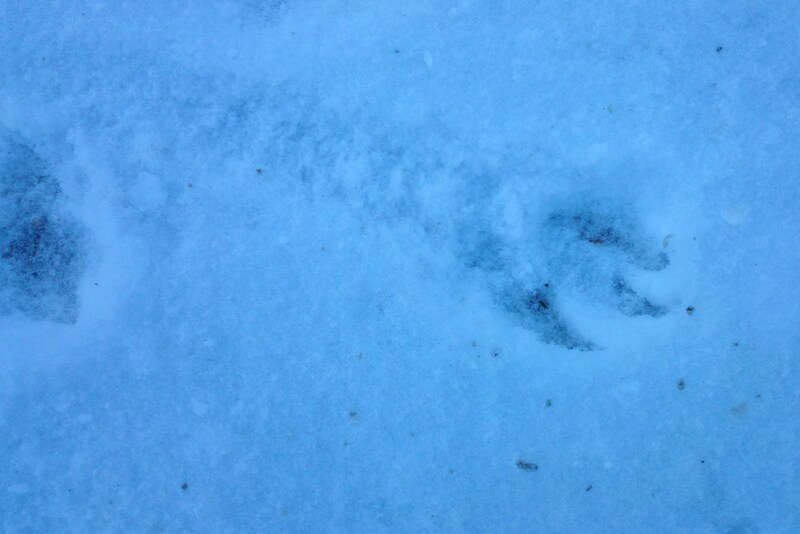 But I haven’t come across anything like these tracks before and I am curious. I haven’t seen anything like them again, either. What do you think they could be? Do you enjoy following animal trails as much as we do?